Every year I post about pollinators, and it’s always a thinly disguised excuse to post pictures of poppies. 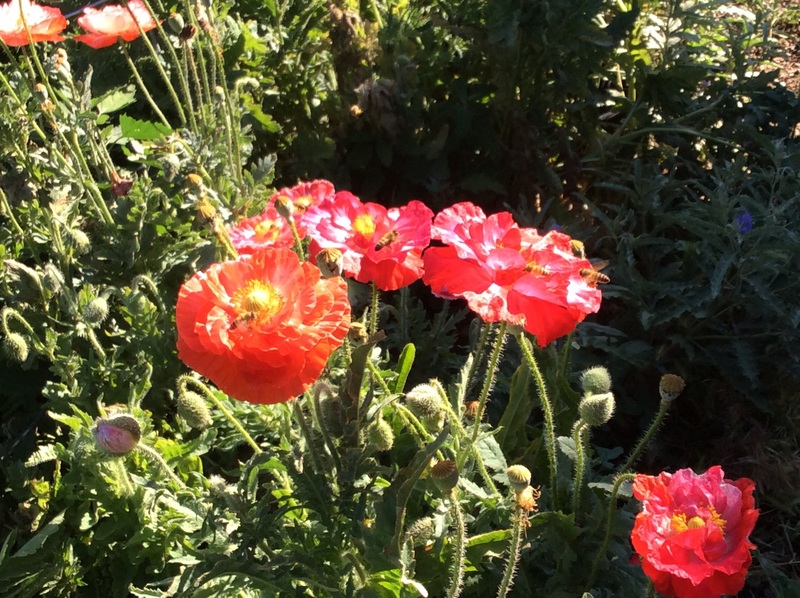 So this year I will just say again that planting flowers that bees like is one of the kindest things that you can do for them, and there is no flower that bees like more than the common Shirley poppy. Buy a packet of seed in late winter, sprinkle it over fertile ground while the weather is still cold, water regularly, and in late May or early June the show starts. 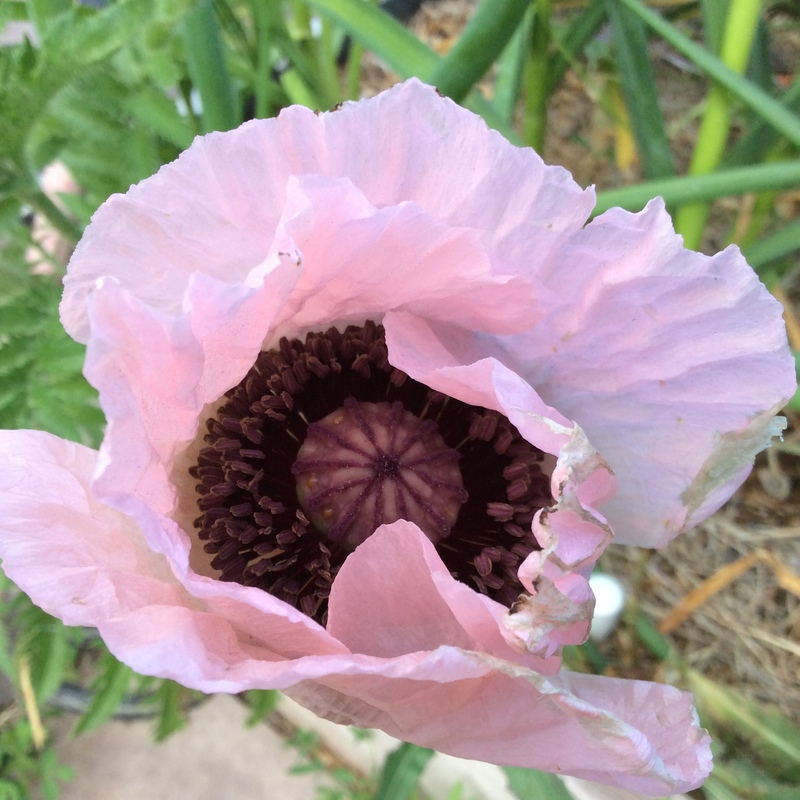 I have started planting a bed of carrots in early March, then sprinkling the poppy seeds over the planted bed. You can’t see it in this picture, but underneath the poppies are carrots, and they are growing quite happily. So it is quite possible to get a crop of flowers for the bees and for your viewing pleasure, and still harvest food from the same bed. After they bloom the poppies die back and the carrots can take over, or if you gave the flowers the bed to themselves, you can dig up the bed at that point and plant something else. 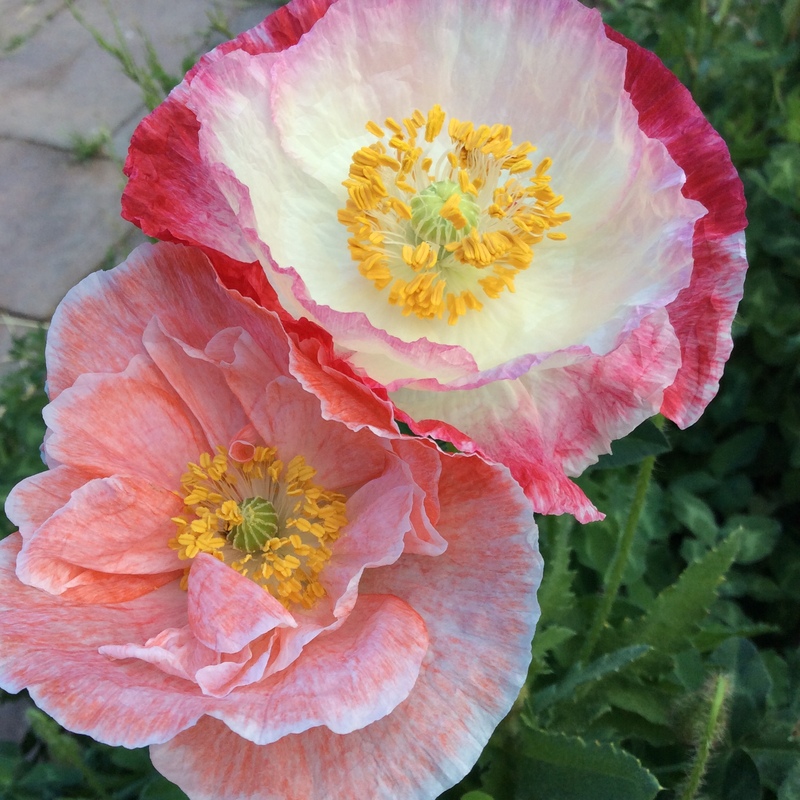 The last few weeks have been filled with work obligations, sad things in the news, and a friend’s urgent medical issue, but I have tried hard to pause and notice the poppy bed every time I walk past it, and listen to the humming of the bees inside the blossoms. 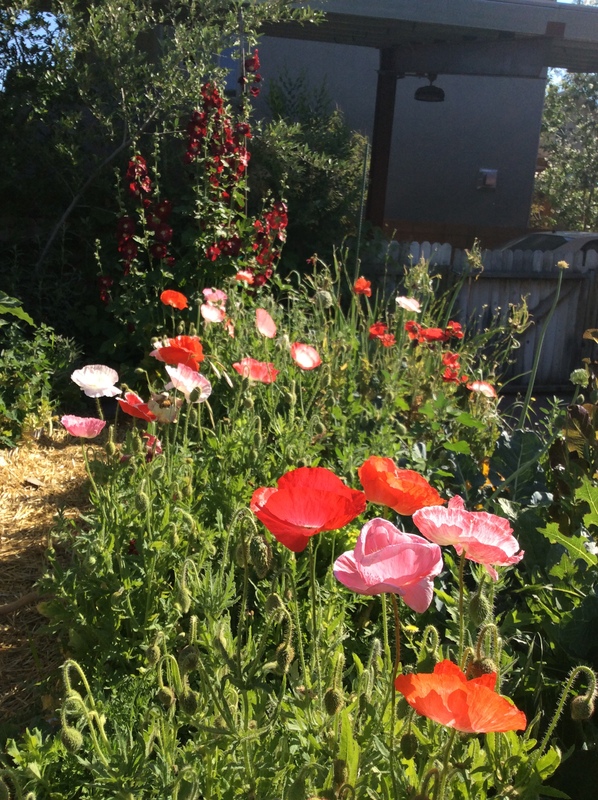 Poppies in June are a good reminder that we too are in bloom only a short time and need to revel in our time in the sun. Sometimes I write a post that is a thinly disguised excuse for posting a bunch of pictures of flowers. However, it isn’t frivolous because flowers really matter. One of my gardening goals this year is to keep a fairly steady supply of flowers going for the pollinators and notice which ones they visit the most. Starting in early spring, the Japanese plum trees were heavily visited. 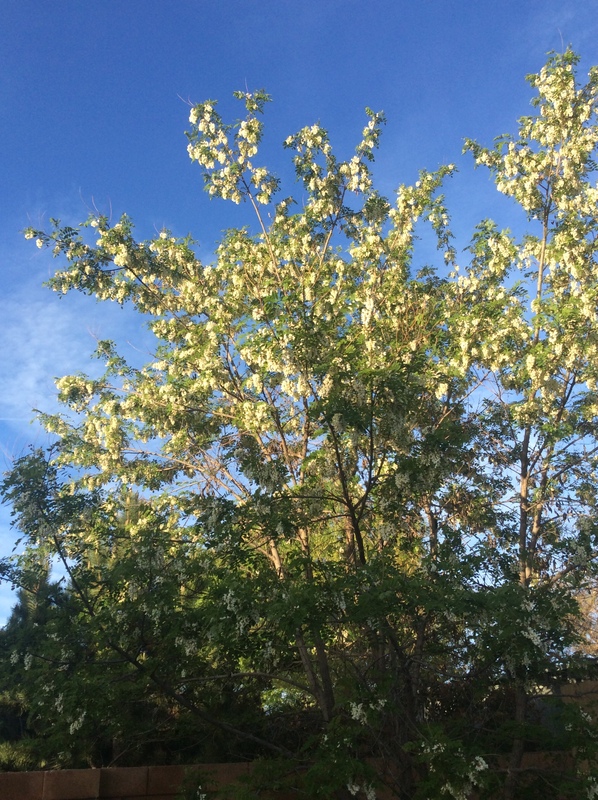 The next thing that bloomed was the black locust tree, and it was absolutely mobbed with bees. I could sit under the tree and listen to the loud hum. 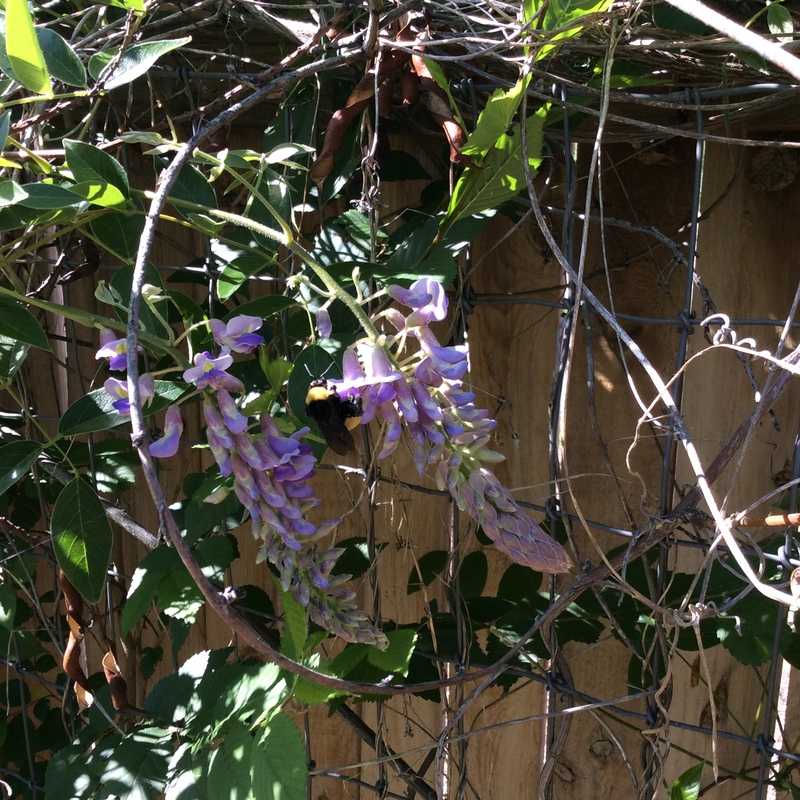 Next, wisteria, which seemed to be especially attractive to bumblebees. Turkish Rocket proved to be a fair bee plant. The olive-leaved sylvetta arugula is exceptionally attractive to pollinators of all kinds. It’s reliably perennial in my garden and can tolerate any amount of neglect. 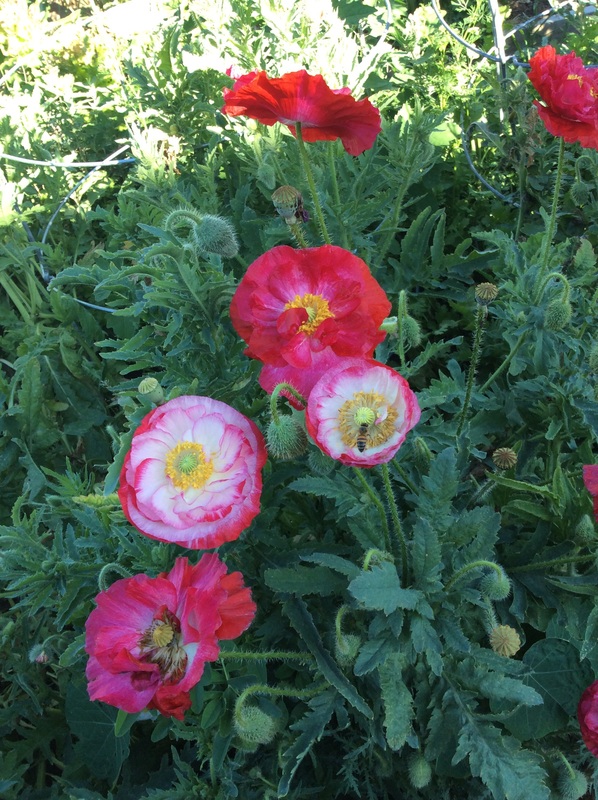 The most wildly attractive of all my nectary plants are the poppies. 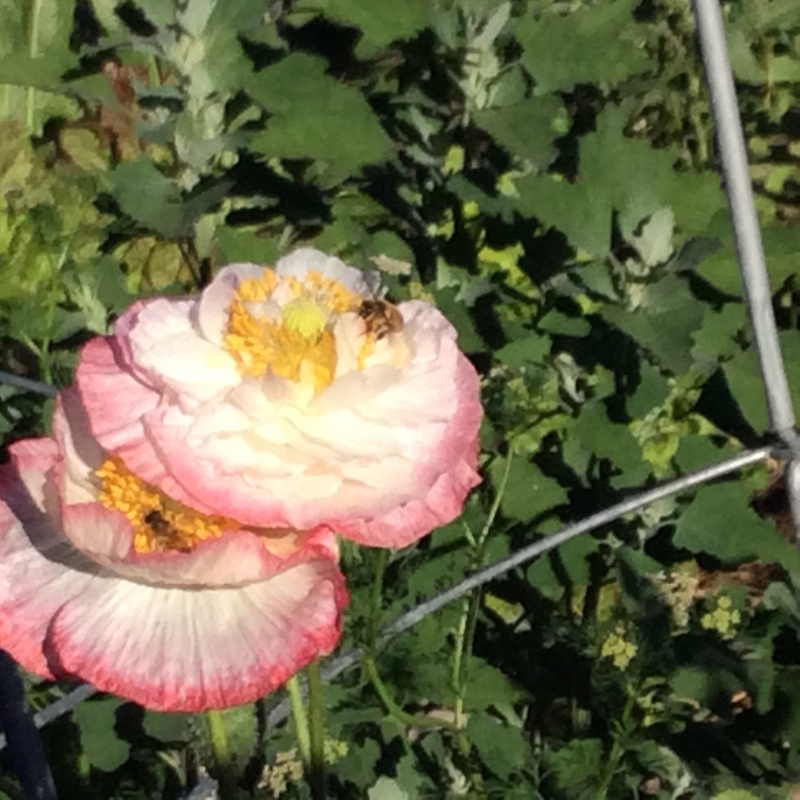 Lavish Shirley poppies, unimproved cornfield poppies, breadseed poppies, Oriental poppies, the bees adore them all. They would be worth a lot of trouble to have, but they aren’t any trouble. 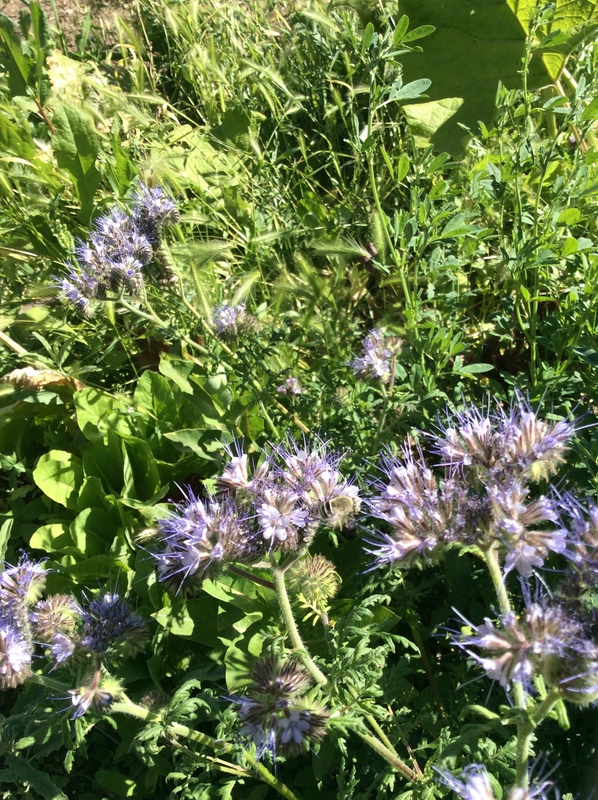 This year I planted patches of bee’s friend, Phacelia tanacetifolia, which is supposed to be the best nectary plant going. 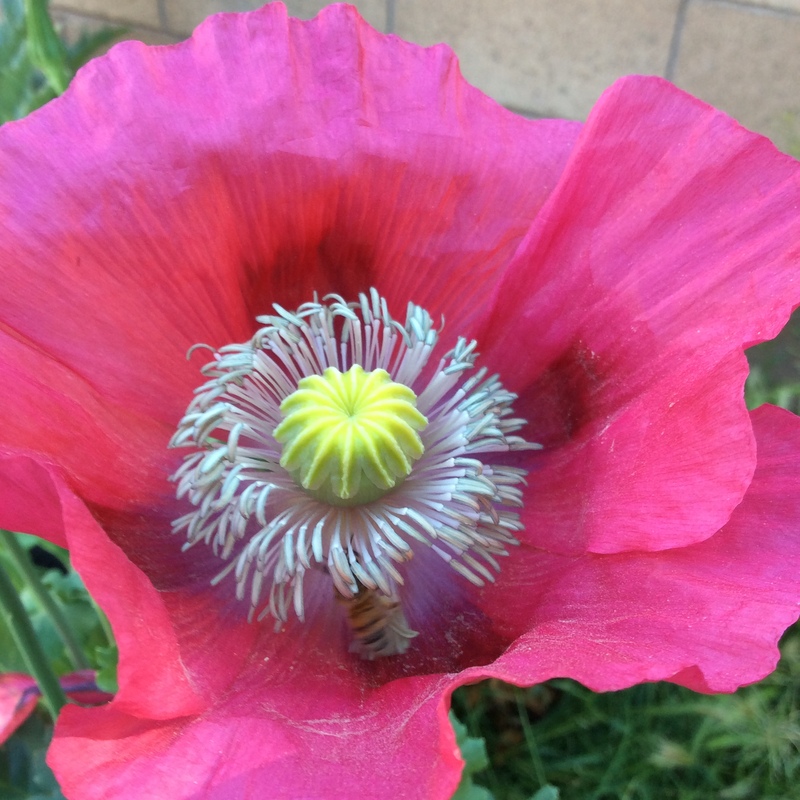 In my garden it bloomed at the same time as the poppies and is being somewhat ignored in the poppy frenzy, but bees do visit it and I enjoy having it around, so I will certainly plant some more next year. 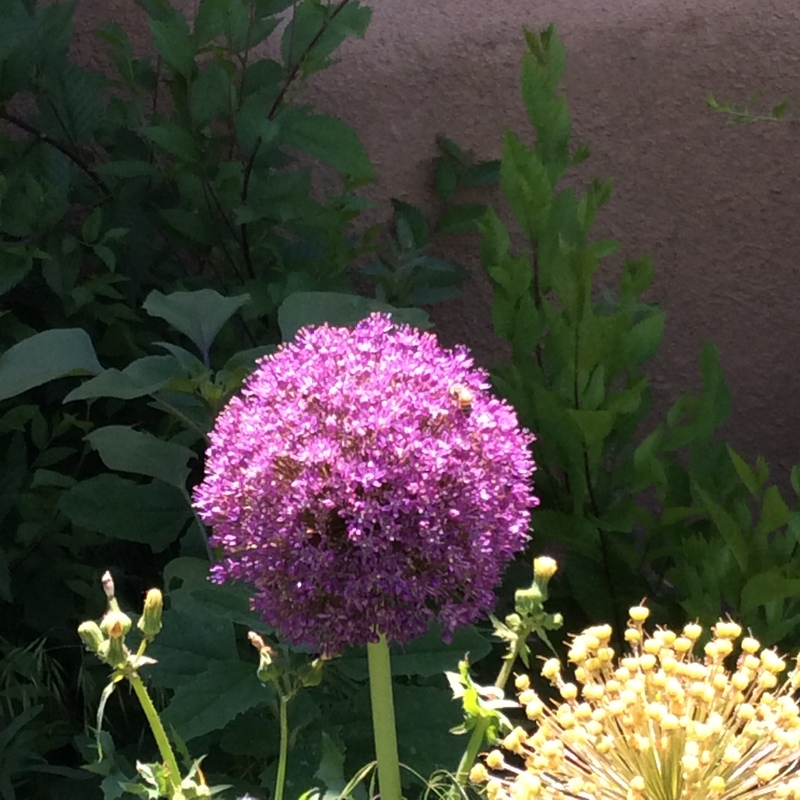 Ornamental and edible alliums that are allowed to flower are a hit with honeybees. 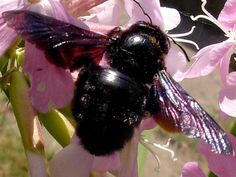 I plant alfalfa all over the place and always let some flower, and my common yard hollyhocks are visited frequently by bees. There are many unspectacular flowers that the bees like just fine. I grew a lot of arugula around my yard and let it go to flower so that it will see that self, and the bees like the small nondescript flowers. 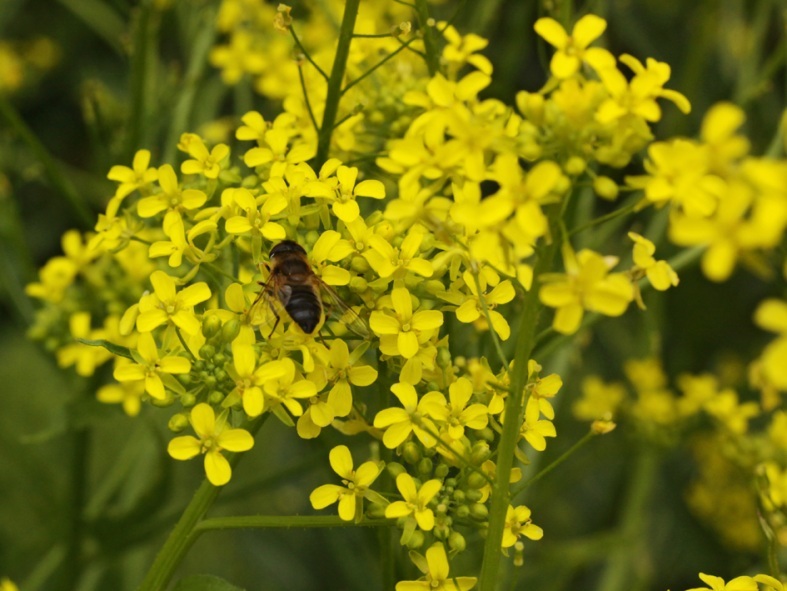 If you grow vegetables in the mustard family and don’t get around to eating them all, you can always let one or two go to seed and the bees will enjoy them. Edible weeds dandelion and sow thistle are liked by bees, making them nice to have around on two counts. Just don’t spray. Please don’t spray. There can’t be anybody left who doesn’t know about our pollinator crisis. I was saddened recently when an experienced beekeeper who is profoundly attentive to her bees told me that she lost a third of her hives over the last year. It can’t be overstated that our friend over millennia, Apis mellifera, is in deep trouble and therefore so are we. Help our bees. All of them. When I think about our country’s independence, I think about personal independence and how important food supply is to that. In maintaining a steady home food supply, one of the things you need is a steady supply of feed for your pollinators. 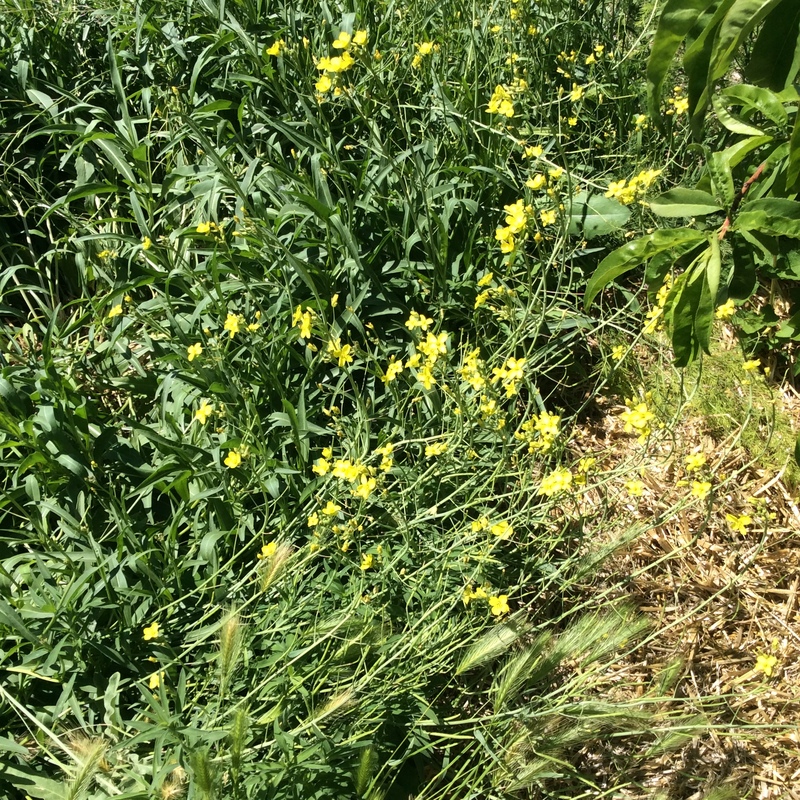 I have been paying a lot of attention to trying to have a steady supply of nectary plants throughout the summer, and in our hot desert summer that can be difficult. 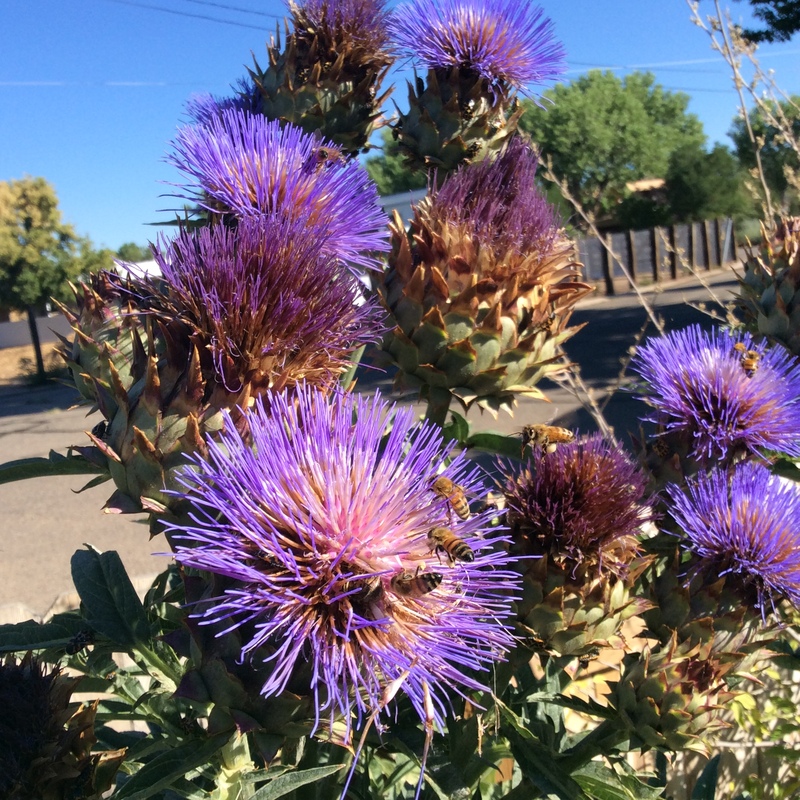 Currently, the poppies are pretty much finished blooming, and I find that cardoons and artichokes are extraordinarily attractive to bees when allowed to flower. I have a number of cardoon plants that grow beautifully in our hot summer and alkaline soil but have not turned out to be much good for eating; one day soon I will post on that depressing topic. But the plants more than earn their keep by feeding my bees in fiery July. 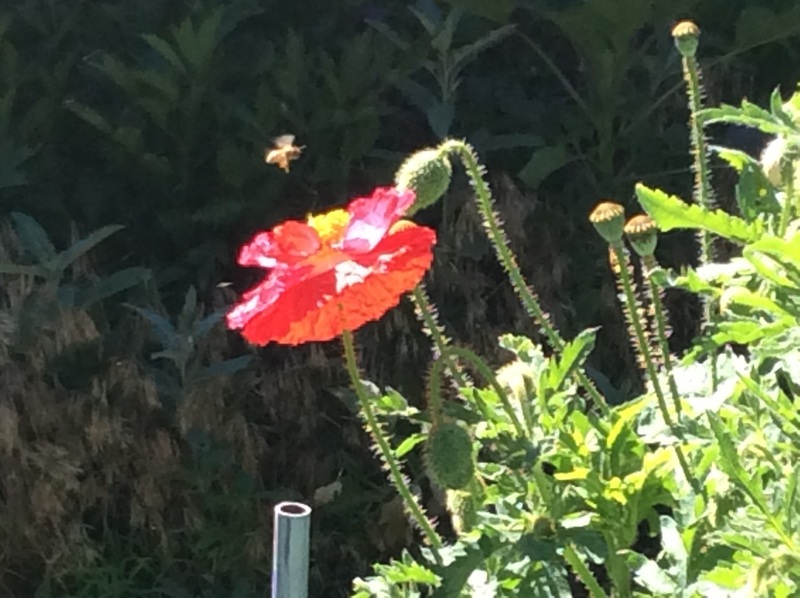 Keep the pollinators in your thoughts when you do any yard planning and planting. Remember that they are extremely sensitive to sprays, and in my opinion there is not a good justification for a home gardener to use insecticide sprays in the garden. 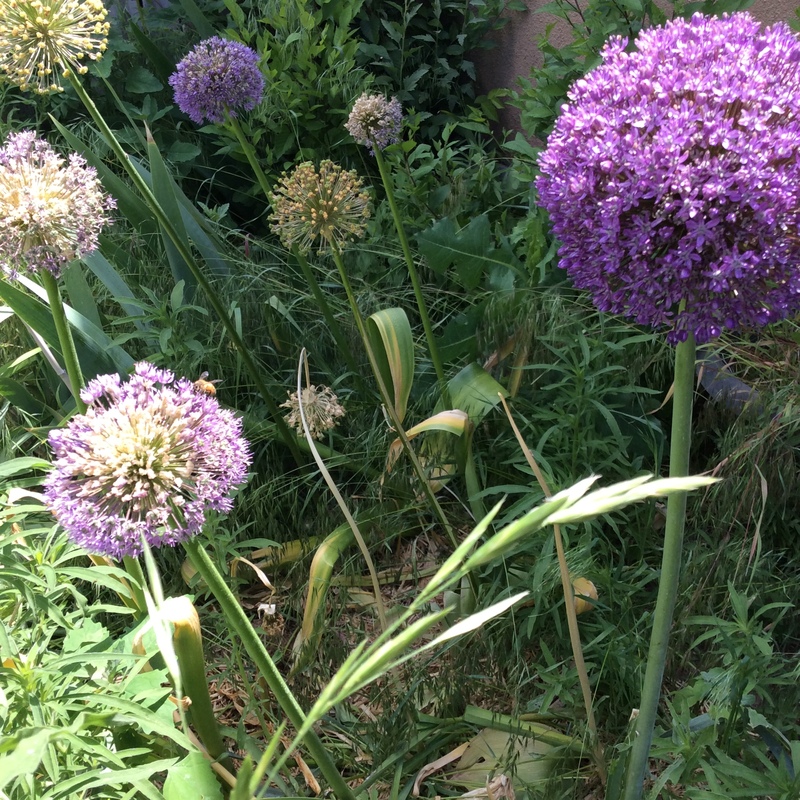 Look around your neighborhood in July and August and see what is blooming or ready to bloom, and think about providing some of it for the bees and wasps. 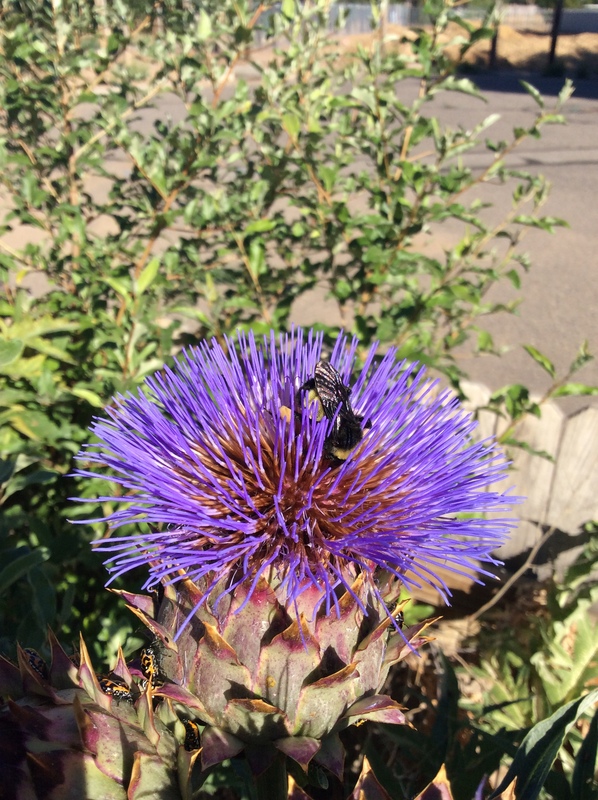 Right now cardoons are front and center in my garden, cutting celery that I allowed to bloom is drawing beneficial tiny predatory wasps in large numbers, and sunflowers are just starting. I planted a few cannas this year in order to do kitchen experiments with the bulbs in the fall, and as long as they are kept well mulched and given some water they sail through the heat, and those flowers also seem attractive to bees. Bless our bees, because oh, how we need them. Surely everyone knows by now about the bee/pollinator crisis, and all I plan to mention here is that we gardeners can do a bit to maintain the bees that we have left. If you want your fruit trees and squash to bear, then bees are a personal issue for you, and the best things that you can do for them are garden without any insecticide sprays (the drift from which can spread a long way and is very toxic to bees) and feed them. 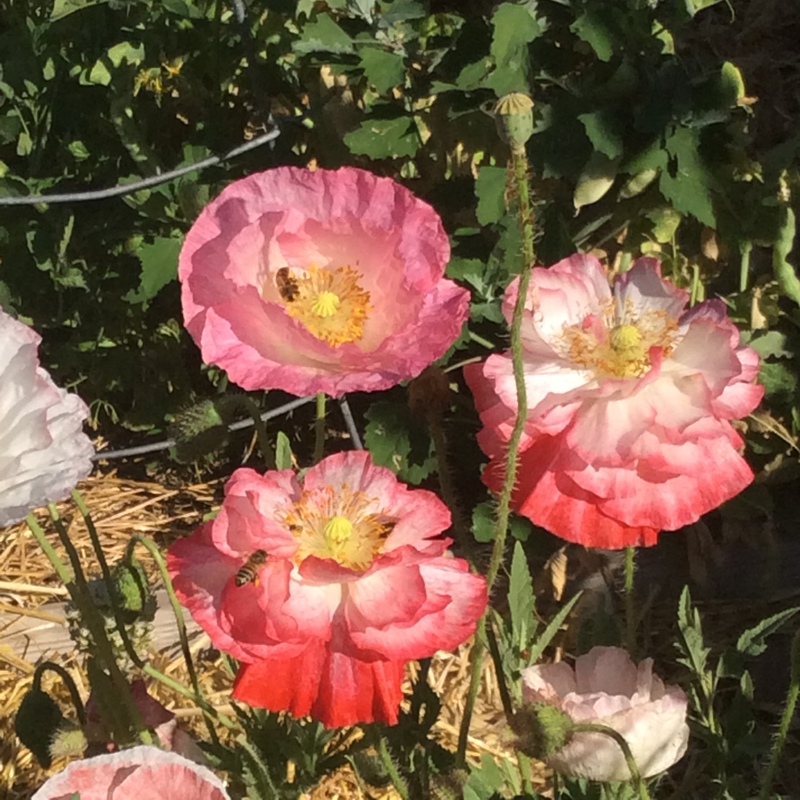 This year I’ve managed to keep a succession of plants blooming that are attractive to bees, but by far their favorite is the common Shirley poppy, available in nearly every seed catalog. 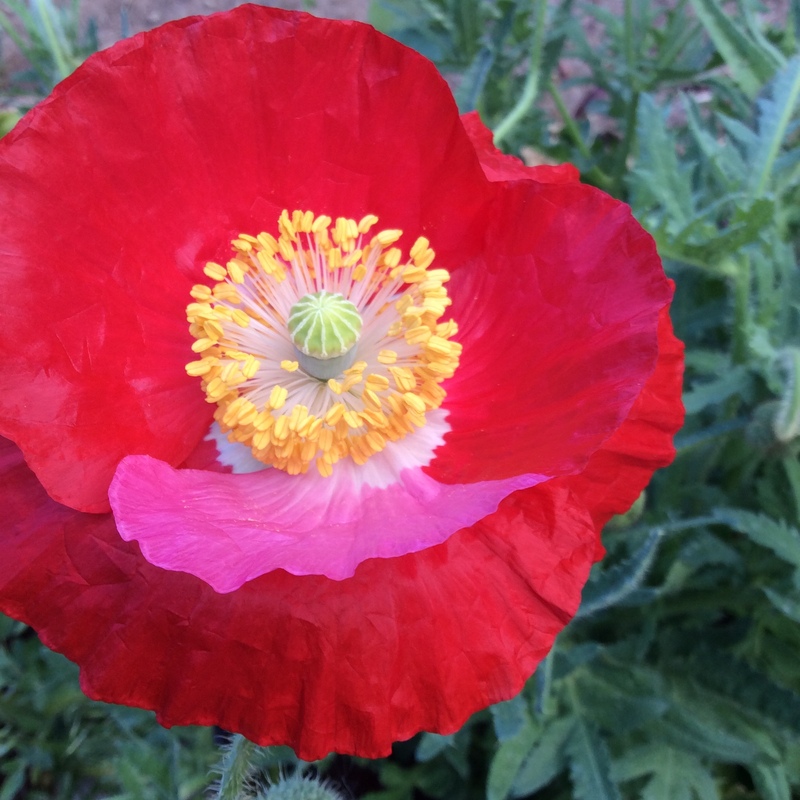 While the weather is still cold, scatter the fine tiny seed around in spots where the poppies can get big and bushy in midsummer, keep the area watered and weeded, and let them do their effulgently gorgeous thing. I scatter the seeds around my tomato bed in late winter, they hog the bed in June, and then can be pulled out after blooming to give the tomatoes breathing room. Every morning they lift my spirits twice: first when I catch sight of them and again when I get closer and hear the continual hum of bees working. I am thinking of getting a beehive so that the third thrill can occur when I see them filling combs. 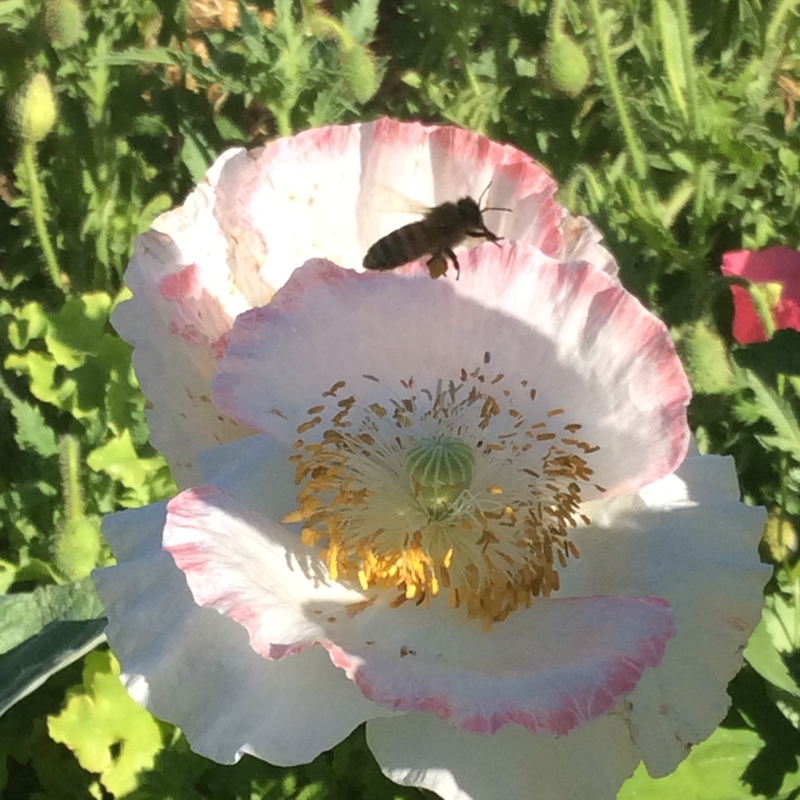 I should add that the leaves of Papaver rhoeas are edible in cooked greens mixtures, but they are no great shakes, so think of this plant as food for the bees, not you.